Want to skip straight to the escape room section? Then click here. 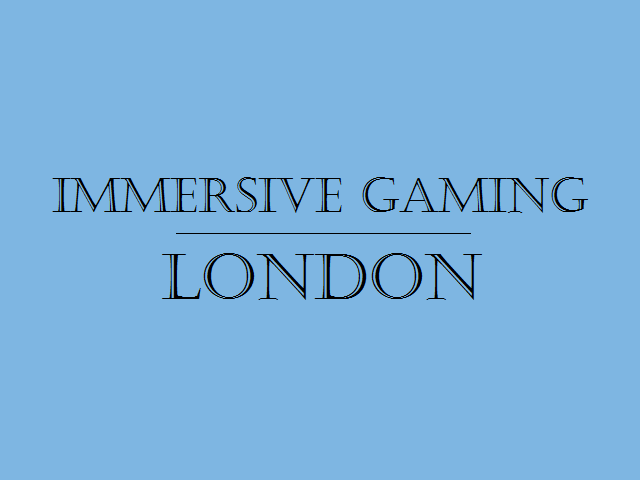 Welcome to the February 2019 edition of the London-focused immersive gaming rumours post. Note that this focuses on London (and the surrounding areas). If you want to know about escape games further afield, then you can follow exitgames.co.uk, where I publish a weekly update on the UK escape room scene. For those of you interested in what I’ve been up to over the last three months, it’s been pretty quiet, with only ~30 games. That included the new games from clueQuest, Breakin’ and Lock’d, four London Escaped games, two Escape London games, a quick trip to Tulleys, XScream and Guildford Escape Rooms (all on the outer edge of the capital), plus a trip up to the NW and NE of England. Highlights were clueQuest’s cQ:ORIGENES, Tulley’s Nethercott Manor, X-It Games’ Afterlife, The Escaporium’s Crux Codicillus, Guildford Escape Rooms’ Venus, all of Escape Quest’s games and Lucardo’s University of Magic. It’s old news now but, just before Christmas, The Game is Now opened its doors. For those of you living under a rock, that’s the new experience from the creators of Time Run and Sherlock. Initial comments from escape enthusiasts were mixed, suggesting that the game had good potential but was still bedding in. More recently. there’s been an uptick in the enthusiasm although, from what I’ve heard (and perhaps not unsurprisingly), it’s aimed more at Sherlock fans than escape room fans. As with all new games from companies I’m a big fan of, I’ve delayed booking to let them work through teething issues but I think it’s about time I booked in! Fox in a Box are about to open their venue in East London. With three games from the start (including two copies of one), all of which are tried and tested in other parts of the world, that bodes well. While Fox in a Box may not bring five-star games in terms of puzzles and immersion, my experience (from Spain and Austria) is that they deliver consistently good customer service, which also bodes well. Escape Room Tourist raves about Zodiac Killer, the one game coming to London that I haven’t played elsewhere. clueQuest launched cQ:ORIGENES and are about to launch Ubisoft’s Assassin’s Creed VR game. Both are impressive experiences. I played the former last week, and it shot straight up to the top of my London rankings. It’s a game which manages to do well in every department: set, puzzles and story. As I’ve come to expect from clueQuest games, there’s some humour interwoven with the experience but, this time round, there’s an edge I’ve not see before. Meanwhile, the Assassin’s Creed experience is one of the few VR games which is worth playing in its own right rather than just to see how far the technology has come. Speaking of VR, Omescape have imported my other favourite VR escape experience, Huxley. I played the two-player version in Berlin and had a great time – expect fantastic graphics and puzzles that you could only create in a virtual world. London Escaped continue to open new games: School of Magic in November, White Walker in December and, this month, both Wizard’s Cup and Vampire Slayer. My reviews of the first four are written and should be out in a few days but, to be honest, while I was impressed by the decoration, I was disappointed by the games. If you want to play just one, I’d opt for Da Vinci. Sadly, Phobos 17 closed down just before Christmas, but the company behind that game, Mostly Harmless, has bounced straight back with a new game at the Vaults. Escape the Jacket is a half-hour room where you take the role of a Magician attempting their most dangerous stunt yet. As the website says: Strap yourself into the Magician’s straight jacket… the water is rising! The Imperial War Museums are re-opening their Clockwork Dog-designed game, Damage Control, over half term. If you fancy a trip to the HMS Belfast anyway, then it’s an absolute steal – the price includes admission for up to six players. Probably not worth visiting just for the game, though – you can read my review here. Locked in a Room at the ExCel centre have closed down all five copies of Invisibility Gene and replaced them with their latest game, Parallax. While their previous games were logical and flowed reasonably well, we weren’t super impressed with them, but I’ve heard that Parallax is a little more advanced, so I’m curious to see how it compares to other London experiences. Escape Land has relaunched its Professor Oxford’s Experiments game (which was itself a rework of their original room Age of Steampunk). The updated game is called Right to the Throne, but the website is pretty clear that you shouldn’t play it if you’ve experienced Professor Oxford. After several years of running their original two rooms, HintHunt finally refreshed their location taking out several copies of their games and adding in two new experiences: Deep Down, Torpedo and The Safe. I played the former two in Budapest and, although they were interesting, they never lived up to their high-tech billing – seemingly losing a sense of flow in the process of making them highly automated. The Safe seems to be a portable game that you can play in their venue if you choose – I’ll leave you to make your own minds up about how that portability will affect the gameplay. The Crystal Maze has been running in Islington for a couple of years, but they’ve taken the decision to move over to the West End, presumably with an eye to catching the tourist market. The northern venue closed down at the end of 2018, while the new location opens its doors next month. The Red Bull Mindgamers competition will be coming to London in the spring to crown their world champion. Having taken part in the finals last time around, I’ve been fortunate enough to be involved with the design process this time, and I’m excited to meet the international competitors who’ll be arriving from around the globe to play! As ever, if you’re looking for general recommendations in the capital, you can check out either my London guide, which lists my favourite games, or the more detailed recommendations based on whether you’re looking for a two-player or eight-player game, like mechanical puzzles or need wheelchair access. And, if you’ve read this far, you may be interested in my irregular enthusiast meetups. If so, drop me an email and I’ll send you the details! The big news at the moment is the Vault Festival, which started a couple of weeks ago and finishes at the start of March. As mentioned above, there’s a 30-minute escape room, but that’s not all from an immersive gaming perspective – you can read my full rundown of recommendations here (including Lamplighters, Bring Them Home, Flight, Seance, The MMORPG Show III, Call Your Mum and Werewolf Live). Since then, I’ve also seen Fight Night recommended. A Door in a Wall are re-opening Lights, Camera, Action after its beta run late last year. Their latest experience moves away from their detective stories with a game that doesn’t involve a murder! Instead, you’ll have to produce three films. But don’t worry – you’ll still be interacting with their excellent actors, scoring points and even solving some puzzles! Tickets are available now for the show, which runs fortnightly from the start of March. Silence of the Lambs meets Black Mirror? If that sounds good, then perhaps Secret Theatre Project’s latest show will be up your street. It’s not quite a traditional game, but you’ll attempt to solve a murder and the audience decides the fate of the accused, so it sounds like something that will appeal to immersive gamers. For King and Country is returning to London, this time with two shows. The first, which they ran in previous years, is set in 1940, and the other picks up the tale four years later. While the shows are standalone, they’re designed so you can play them consecutively, with the story flowing on between them. I played last year and was impressed by the huge effort they made to take players’ actions into account when deciding what happened in the show – more like LARP than simple immersive theatre. Variant 31 is a new zombie-themed immersive gaming experience appearing near Holborn, with tickets from April to June currently on sale. It’s not clear exactly what it will be, but Immersive Game Labs (£2.5 million in seed funding and run by the founder of Tough Mudder) are currently playtesting their experience. As per usual, Puzzled Pint takes place on the second Tuesday of the month. If you’re looking for some fun, sociable puzzling, then it’s a great start. And, if you’re nervous that the puzzles will be too hard, don’t worry – there’s a games controller who’ll help you out as much as you need. You can check out puzzles and solutions from previous months on their website here. Now Play This is back in April for a week-long festival of Experimental Game Design. I’ve never managed to go, but it’s always intrigued me, and several friends rate it highly. No announcement yet of what will be showing, but the theme is “community”, so expect some interesting offerings – there are usually plenty of hands-on demonstrations of the games as well as interesting talks from experts in the field. Groupon has London Escaped, Adventox, Omescape and Breakin on their site. If you want to take advantage of the offers but don’t want to support Groupon, I recommend dropping an email to the venue asking if they’ll offer you the same deal – they’re usually willing to match it, and the bonus is that they get the full amount rather than just 50-70% of what is already a reduced fee. Wowcher has City Mazes, Lift of Doom (from Funtime Immersive). That’s all I’m aware of. If any of the above is incorrect, then let me know via email or in the comments below; or, equally, if you’re aware of other news, discounts or competitions, tell me, and I’ll include updates in the next edition. We completed Dinoland in Gravesend as a team of 4 last night and I wish I’d read your review before we did it as opposed to this morning! I found myself nodding along to what you’d written. I must admit, I was disappointed with the room. With the merchandise available and lots of people telling me it’s their favourite room or how great it was, it unfortunately didn’t live up to expectations. We’d purchased the panic pass and this was our 6th game for that so we got it half price, which was a good deal. You say it may be better with more than 2 people, but what we then found with a lot of the puzzles is that only one person could solve it and there was limited things for the other people to then be looking at/doing/searching as with other rooms, because what you needed to do in each area was limited because of the number of areas you were in. The ending left a lot to be desired in our opinion, with my brother even commenting “oh is that it?” once we’d escaped as we didn’t realise that was the end. I think for us, what didn’t help was that we had just done the Happy Institute which had a great ending and is definitely my favourite room to date. If you haven’t done it, I’d recommend it. Two others in the South East we’ve recently done and really enjoyed we’re Prison Escape at Time 2 Escape in Strood (just down the road from Gravesend) and Overthrone in Basildon in Essex. We’re doing Revolucion Ole on Saturday and I’ve made sure to read your review in advance! We were tempted to go hard, but I think we’ll leave it as it is. Thanks! It’s the eternal peril of escape reviews – you don’t want to read them in case they lessen the enjoyment but they might hold a nugget of information that helps to improve (or avoid!) the experience. Dinoland is really tough – if you like adventure then it’s a great experience and I’ve seen loads of people rave. I appreciated it more than I enjoyed it (although I did enjoy it a lot). When I talked about larger groups enjoying it, I imagined that they would get caught up in the excitement. I don’t think it would be the puzzles that worked better – they rarely had a lot of puzzle to attack at one time. I believe they changed the ending of the first part to improve things and that presumably sets you up for the second part. We played FKAC and I don’t think that would have worked either.